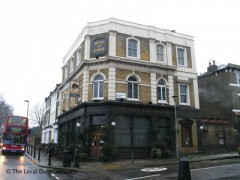 About: The Bull & Last is a pub serving food and bar snacks as well as a variety of beers, spirits and wines. It also has a restaurant and a function room. Both can be hired for private parties. Seating on the pavement area is provided. Imagine the scene: a lunchtime stroll over picturesque Hampstead Heath leads onto a mid afternoon roast dinner at The Bull and Last on Highgate Road, arriving clear of mind and rosy of cheek, you realize, this is living. Plus, having scooped last year’s Observer Food Monthly’s Best London Roast, you can be assured that the Sunday lunch that awaits you at The Bull and Last will impress. What a day out. Used to be a fine pub. Has now been repositioned as a restaurant with just a very few seats for drinkers. Food is adequate and overpriced, seating is cramped. Service friendly. The atmosphere has disappeared along with the genuine locals, it's deeply disappointing. All in all this place is a shadow of its former self. I could not recommend as it is. If you are in the vicinity then I suggest visiting the Dartmouth Arms around the corner which a genuine pub with realistically priced food. I hadn't been to the Bull & Last for a little while as the previous time I hadn't been very enamoured with the place. I heard on the grapevine that a couple of locals had taken it over. loud enough but certainly not intrusive. The bar staff were very welcoming and added to the buzz of the bar. We decided to stay for dinner and the food was excellent and took the perfect amount of time to arrive. Having eaten, we then carried on drinking and stayed until closing time. It was a great afternoon/evening and I cannot recommend it highly enough - go!